With the main body of construction out of the way, it was time for our first “official” session here at Earthstar Creation Center. Our good friend and multi-talented sax man, Matthew DeMeritt invited Sheera Ehrig and some friends to stop in for a test drive. Accompanying Sheera (lead vocal) was exceptional Brazilian guitarist Fabiano Do Nascimento, veteran bassist Doug Lunn (Wayne Kramer, Mark Isham, Sting, Bruce Springsteen), and drummer Kevin Moore II. It wasn’t long before they were done with a gorgeous rhythm track for the song “Freedom” (Planetary Alignment). All in all, this awesome quartet gave us a perfect opportunity to take Earthstar out for its first voyage. Sheera herself is one of those uniquely talented, extremely musical people who can play a bit of everything. 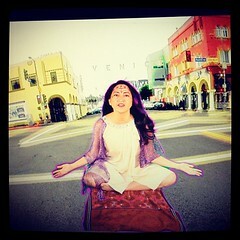 An LA-based singer, songwriter and producer from Venice Beach, CA. In addition to having a beautiful voice, I have seen Sheera jump on just about any instrument and start jamming. More importantly, she also produced, recorded & mixed her entire CD on her own. For recording the sessions at Earthstar, she may have had a wee bit of help from mixer John X Volaitis, but the rest of it was completed on her own (and beatifully done, I might add). Big props for sisters doing it for themselves! I know Sheera Marie Ehrig, Los Angeles, CA; Musician; she’s cool and nice person.